Looks like chamomile without petals. Very short, usually no taller than a finger. Tea can be made from whole plant, which can also be used as insect repellant. Uses are similar to chamomile, which are reducing stress, anxiety, colds, fevers, stomach pains and cramps, diarrhea, gas, digestion. After giving birth, it’s used to to expel afterbirth and bring in mother’s milk. There is a more toxic lookalike called Mayweed chamomile or “stinking chamomile”, which is taller and smells bad when rubbed. 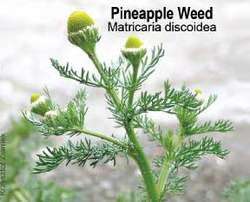 Pineapple weed smells nice and has actually been used as a natural perfume. Sweeter than chamomile.